Family memorial in St Mark's Church, Jersey. Youngest son of the late Richard & Mrs Hingston of 2 Upper Kings Cliff, Jersey. One of two brothers who both fell in 1915. 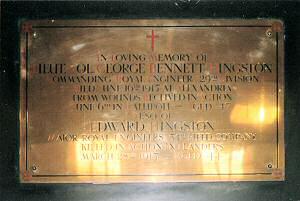 Brother of Lieutenant-Colonel George Bennett Hingston. Husband of Annie Amelia Hingston (nee Radcliffe) of Kent. Killed in action at Levautie, aged 44 years. Another Old Victorian Killed in Action. In the latest Casualty Lists appears the name of Major Edward Hingston, commanding the 54th Field Company 7th Division, who was killed in action on 27 March. 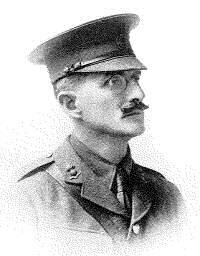 Major Hingston left for the seat of war in November and since that period has done much good work on behalf of the cause of the Allies, his duties as an officer commanding an Engineering Company taking him to the very forefront of the fighting. 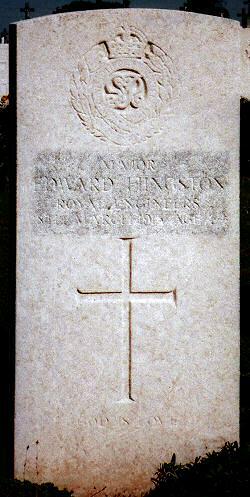 Major Hingston, who is the youngest son of Mrs Hingston of 2 Upper Kings Cliff, was an Old Victorian, he having been a pupil at the College from 1881-86. The deceased officer leaves a widow and daughter and to them and to his bereaved mother we would tender our sincere sympathies.